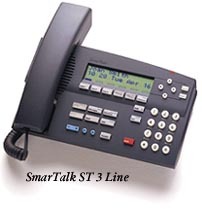 PLEASE NOTE: Smartalk went out of business in 2006. We have customers with these phones and are looking to purchase used ST series phones, power supplies and Music on hold adapters. Please contact us with any questions. NEW!! I have access to 7 sets and some power supplies. Please call if you're interested. If you have a Smartalk system and are replacing sets we suggest adding a Talkswitch or SBX320 system as an inexpensive upgrade. This allows you to keep your existing sets and replace them as they wear out. Ask us how! We do have several of the older model sets in stock. These are used but have a 60 day warranty.